A single implant is a great way to bring your smile back to life, and is the best permanent replacement for a missing tooth. A dental implant replaces the tooth root, and is completed with a crown that will look and function like a natural tooth. To receive a single implant, patients must have healthy gums and strong bone density in their jaw to sustain the implant. Patients must also implement a dedicated oral hygiene routine, including regular dental visits to ensure the long-term health and success of dental implants. 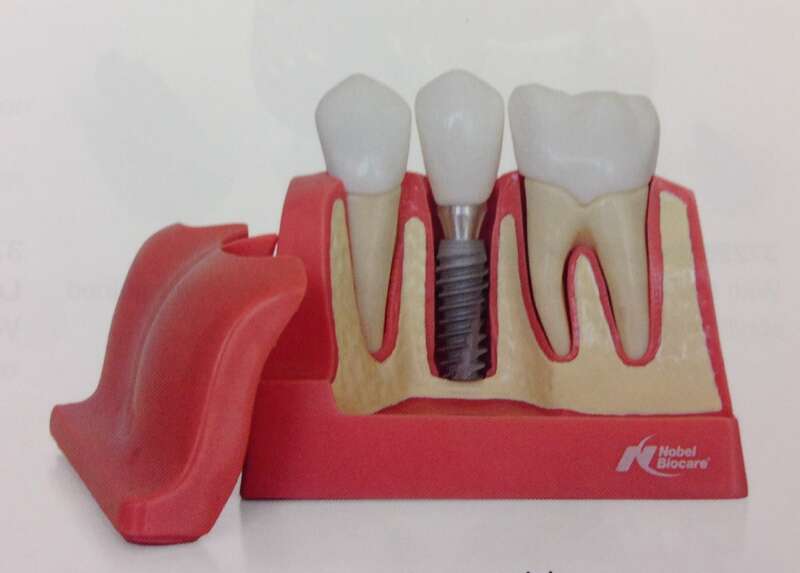 A dental implant looks and functions exactly like a natural tooth. As compared to conventional bridges, a common alternative to dental implants, dental implants replace a single tooth without affecting the neighboring teeth. A traditional bridge requires that the healthy teeth on both sides of a missing tooth or gap are ground down so that a bridge, that consists of an artificial tooth that is attached between two crowns, can be placed over the area to cover the empty space. In terms of long-term sustainability, a single implant can be easier to maintain and appears more esthetic than bridges. Gum health can potentially be compromised with a bridge because the surrounding tissue can recede, exposing the implant and affecting the patient’s smile. In some cases, the cement-like substance securing the bridge in place can wear over time, enabling bacteria to grow and affect the teeth supporting the bridge. Further, the use of bridges can make it difficult for patients to floss, increasing the chances of developing gum disease. Dental implants are the best permanent solution for missing teeth because the underlying bone is better preserved with a dental implant since the root is replaced. It’s important to choose a doctor who understands the structure of the mouth and will not harm the adjacent teeth by grinding them down in order to attach a bridge to them. The true value of a single tooth implant is the preservation of the natural dentition. Dr. Aalam and Dr. Krivitsky’s extensive experience allow them to flawlessly execute dental implant procedures, helping restore the smile and confidence of their patients. 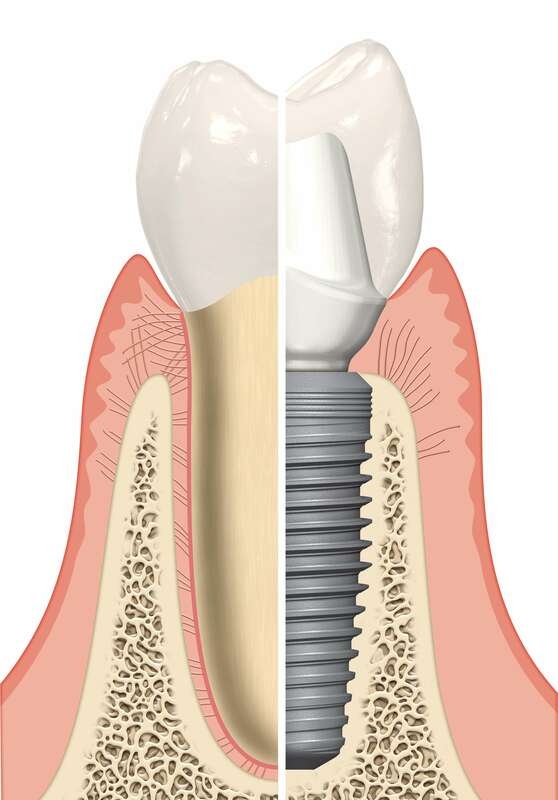 An implant is a small post, most commonly made of titanium, that functions as a tooth root and is inserted into the jawbone beneath the gum line. The post serves as a foundation to which your periodontist can affix a replacement tooth. 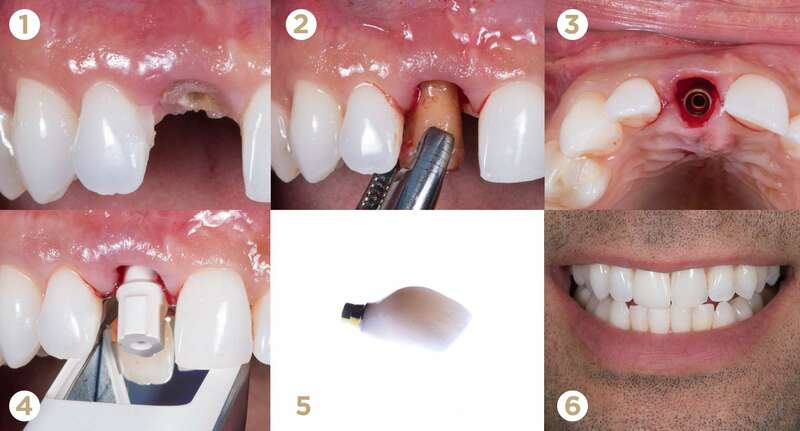 Once the procedure is complete, the actual implant is not visible, and the replacement tooth blends in seamlessly and naturally with the patient’s other teeth. The process is fairly simple, but requires an experienced periodontist to perform the procedure to yield optimal results. First, your periodontist will determine if the patient has enough bone to support the implant. If a patient experiences bone loss, they may require a bone grafting procedure. For patient’s who possess enough bone density to sustain an implant, the periodontist will insert the post into the jaw in place of the old or missing tooth. Over the next few months the implant will naturally fuse to the jaw bone, for permanent stability. At this time, a temporary tooth placement can be worn over the area to keep patients’ smiles in tact. After the jaw has healed, a periodontist will attach an abutment to titanium implants, which serves as the connection between the implant and the permanent crown. In the case of zirconia dental implants, the implant does not require an abutment, and a permanent restoration can be attached directly to the post. Once the permanent restoration has been fastened, the implant process is complete, allowing the patient to eat, speak and smile regularly and confidently. The result leaves you confident with a smile that feels natural and looks beautiful. The procedure is simple, minimally invasive, and almost pain-free. The implants are secured to the jawbone providing stability and ensuring the artificial tooth mounted atop the post won’t slip or shift. With the implant securely in place, patients’ ability to eat and speak normally will not be affected.